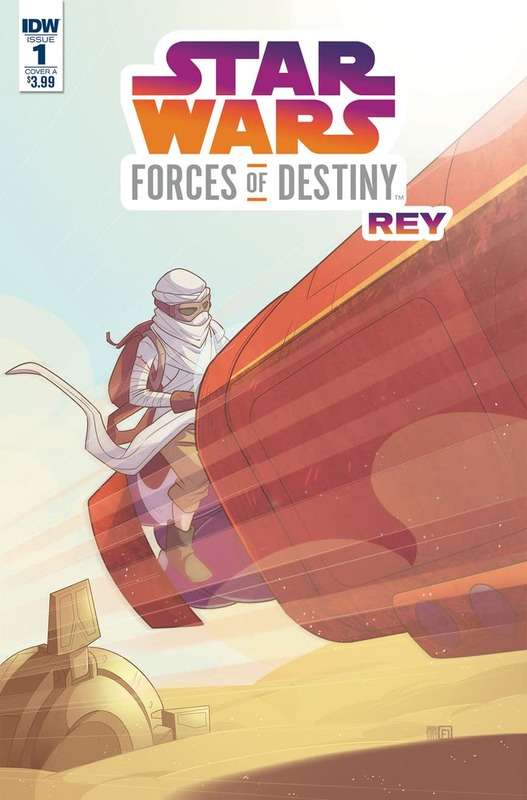 Star Wars Adventures: Forces of Destiny – Rey #1 provides a comic adaptation of the two Forces of Destiny animated shorts “Sands of Jakku” and “BB-8 Bandits.” In addition to adapting those two shorts, there’s some extra pages the provide an intro, and ending, and bridge the two together. Plus there is thoughts bubbles throughout which provide extra insight into Rey’s thoughts which isn’t covered in the shorts. Thus it’s not a straight adaptation and it does offer something extra. The artwork looks good and matches the feel of the show, but it’s also different, so you’re not getting a repeat of the visuals even though it covers a lot of the same scenes. Unlike the Star Wars Adventures comics, there is no bonus story in this issue. For kids or adults who are fans of the Forces of Destiny shorts, this one might be worth picking up. However, it is $3.99, and considering it is an adaptation of the shorts, I wouldn’t consider it a high recommendation. I think this issue would have worked better if it had been a completely original story. That said, I do appreciate them trying to add something extra in and it is a well done adaptation. It’s a fun little read. As is, I give it a three out of five nexus.